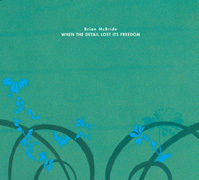 Were subtly and nuance the currency of the music community, Brian McBride would be its richest member. On his album When the Detail Lost Its Freedom (63'19") McBride realizes 12 multi-layered ambient compositions. These works are inviting, lulling and (while seemingly minimal) deceptively simple. Fashioned as if from a kind of machine that exhales musical chords, the music does not seem manufactured. Some sounds seem squeezed into existence while others arrive round and fully formed. To McBride, sound is malleable. The tones and timbres used on this album may have as their origin an electric guitar or string ensemble, but have become so stretched and worn through processing as to have acquired an authenticity beyond their acoustic lineage. With the exception of the occasional vocal, lazy guitar strumming or dialogue sample, this album attracts the listener's attention at no one particular level. The pace is that of one at rest. The slow deep breathing and gentle waves of sound provides the perfect soundtrack for a sleeping city. Formed from a night of warm dreams and friendly visitations, McBride is making spiritual music for a secular audience.